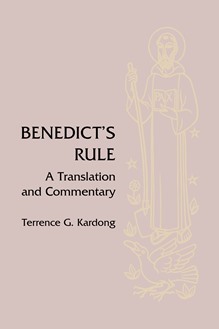 Benedict's Rule: A Translation and Commentary is the first line-by-line exegesis of the entire Rule of Benedict written originally in English. This full commentary - predominately a literary and historical criticism - is based on and includes a new translation and is accompanied by essays on Benedict's spiritual doctrine. A monk who has striven to live according to the Rule of Benedict for thirty-five years, Father Kardong relates it to modern monastic life while examining the sources (Cassian, Augustine, and Basil) Benedict used to establish his Rule. Overviews - summaries of notes, source criticism, or structural criticism - follow some chapters, and a large bibliography of the current scholarship and source references are also included. Benedict's Rule: A Translation and Commentary also includes the Latin text of the Regula Benedicti. This reference work is invaluable to libraries and to those who are called to interpret the Rule. It will be opened again and again. Indexed.
. . . stands as a monument to the Rule's richness and depth, the product of the authors decades of research, publication, and, perhaps most important of all, living out this Rule as a reliable compass for journeying with God. The author's concise and inclusive summary of the vast scholarship of recent years on the Rule will be an invaluable resource for monastic leaders, formation personnel, professors who utilize RB in their courses on spiritual classics and all students of monastic history and spirituality. Terrence provides his readers with a history of interpretation of significant themes in the chapters; the intuitive perceptions of patristic exegesis which undergirds the spirituality of words, motifs, whole chapters; explanations of literary patterns, grammatical anomolies and rhetorical devices through which the rich tones and rhythms of RB are expressed; and penetrating insights into the various approaches of modern scholars to the chapters of the Rule.